Vegas’s loss ended up SoCal’s gain, as the Canelo-GGG pay-per-view cancellation yielded a bargain for boxing fans watching around the world, and in attendance, at the gorgeous and affordable outdoor boxing venue that is the Stubhub Center in Carson, CA. Despite the circumstances, GGG Promotions and HBO together produced a collection of solid bouts, including the first ever live telecast of a women’s fight and leading to the ultimate showcase of their featured fighters, Gennady “GGG” Golovkin (38-0-1 34KO) against Vanes Martirosyan (36-4-1 21KO). According to Nielsen Media Research, the HBO telecast peaked at 1,361,000 viewers, making it cable tv’s number one rated boxing telecast in 2018. Saturday’s show also broke StubHub’s record for highest grossing boxing event. Triple G merchandise were worn by fans throughout the entire venue that evening and even the night before during Golden Boy Promotions Garcia vs. Velez bout. GGG merchandise were sold then too and fans were seen wearing GGG hats alongside young girls wearing Ryan Garcia “The Flash” tees. Such is the power of a champion – your merch is worn on fight nights when you’re not fighting. But enough shop talk. Let’s talk about the fight. This fight seemed an unexpected pit stop for the Big Drama Show 2 that was teased last September seconds after the controversial draw that extended the Canelo-Golovkin saga – two fighters vying for the prefix “undisputed.” After the controversial draw came the controversial “tainted meat” followed by the controversial choice of replacement fighter. (Max Kellerman actually suggested Golovkin went from a fighter who was avoided to one who was avoiding top challengers. Oy.) Let’s not forget the posturing on social media from an angry Canelo and attention needy Billy Joe Saunders. There was all this drama but not the good kind, the junk kind, like a bag of Cheetos, easily consumed yet unsatisfying. Golovkin wanted a fight. He didn’t want to waste a camp. Having fought two or three times per year throughout his entire pro career, wanted to stay active. He wanted to give his fans a show on Cinco De Mayo and then finally move on to the next, and more lucrative card his fame deserved. And maybe, as viewers saw, in the two rounds his opponent remained standing, he also needed to remind people just what his job was in the ring: seek, destroy, defend the belts. It’s difficult for promoters and for media, to hype up a fight when the champion is a soft spoken Kazakh, whose English is limited, who smiles easily, avoids trash talk and can actually be mistaken for an IT guy on a date when he wears Bijan. I am sure it’s not easy to get ‘likes” when your fighter isn’t a charming 19-year-old, predicting a fourth round knockout with a left hook while simultaneously holding promotions on Instagram. And so, Golovkin, the old school fighter, has to make up for all of these shortcomings the only way he has ever known – on fight night. On May 5th, under the stars and klieg lights, as the now familiar thudding beat of his fight song began and fans roared in anticipation, GGG walked out of the tunnel, in his hooded blue and gold Kazakh fight robe, looking like a royal grim reaper, his left arm on trainer Abel Sanchez’s shoulder and Jack White’s “Seven Nation Army” doing some trash talking for him. I’m gonna fight ‘em all/A seven nation army couldn’t hold me back/They’re gonna rip it off/Taking their time right behind my back. 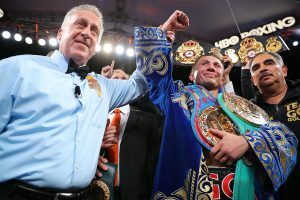 Golovkin had taken a few solid shots from Martirosyan and it seemed, at the start of the second round that it would be a longer night than anticipated. After all, the last time Golovkin fought at StubHub it was 2014 against veteran Marco Rubio and that fight only lasted two rounds before the KO…But we all know what happened. Deja Vu. 12 seconds into Round 2, when Golovkin threw a vicious uppercut to Martirosyan’s chin, that would have brought Martirosyan down had he not literally hung onto Golovkin to avoid a knock down call, the crowd sensed danger. At 1:26 left in the round, Golovkin throws Martirosyan a hard left hook that ultimately puts Martirosyan against the ropes to a barrage of nine, yes nine, punches to his head: a powerful overhead right cross, jab, jab, jab, right cross, right, big left hook, right, big left hook. And down. From my seat I saw Martirosyan’s back against the ropes, his head violently bobbing right and left as Golovkin’s fists met their target. 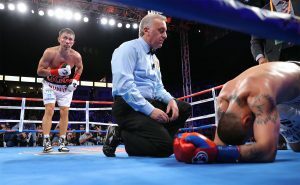 As his opponent collapsed to the floor, Golovkin backed away and looked grimly on as the referee counted. Golovkin knows his fans. He gave them what they wanted. No hype. A show of pure boxing. Let’s hope Golovkin, in the rarefied world of high stakes fights, finds his way back to StubHub in the not too distant future and that HBO finds a way, and not by accident, to provide amazing non pay per view fights for the masses – for true boxing fans.